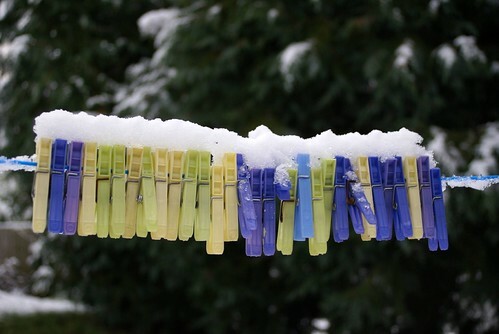 Chilly clothes pegs, a photo by PhylB on Flickr. Mummy had a basket of clothes pegs sitting on the patio outside her bedroom door. I think clothes pegs are quite fascinating. I am particularly curious about the mechanism holding them together and causing them to open and then spring closed. I took about a third of them apart just to check exactly how they worked. Mummy wasn't the least bit pleased with me but I heard Daddy saying 'I bet Amaia is going to grow up to be an engineer', so I guess he is proud of me!